It's almost too easy—just a pinch of some magic powder and suddenly you're a fat-burning machine? Well maybe not a machine, but fiery cayenne does seem to have an effect on increasing the metabolism. It's well documented that turmeric has anti-inflammatory properties that give Advil a run for its money, and cinnamon is coveted amongst those with metabolic disorders thanks to its blood sugar-lowering effect. 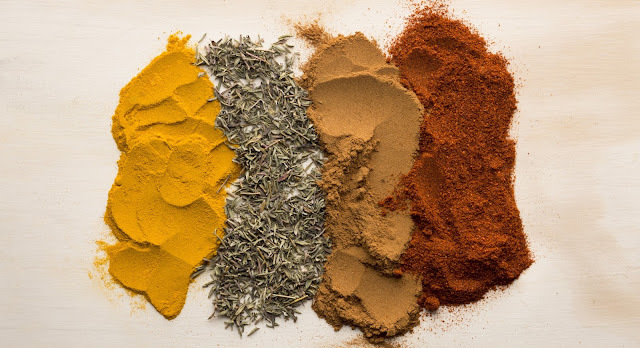 The rest of your spice rack isn't to be overlooked—there are some superfood seasonings hidden in the pantry that are worthy of a little more love. Put down the salt and start cooking with these spices—your blood pressure, waistline, and tastebuds will thank you. Sweet, spicy, smoky—paprika comes in tons of different flavors and varieties, but it's always a vibrant brick red. Thanks to its plenitude of antioxidants that impart its quintessential color, paprika is also full of vitamins A and E. Together, they fight free radical damage in the body, but vitamin A also promotes cell growth and recovery, which supports anti-aging. With its distinct taste and smell, fennel is often loved or loathed. If you fall into the latter category, this classic Italian seasoning is worth your adoration—full of phytonutrients, fennel has been proven to have anticancer and anti-inflammatory effects. A special phytonutrient called anethole found in fennel has been linked to slowing the growth of cancer cells and apoptosis, or cell death, in breast cancer cells. Additionally, fennel's antioxidants can help reverse damage to liver cells... So after a really rough night out, look to this spice to help heal your hangover. Especially popular in some of the most beloved holiday foods—gingerbread, hot toddies, and pumpkin pie, to name a few—cloves are a warming and aromatic addition to any dish. Along with their lovely flavor, cloves impart another interesting element to dishes: eugenol. A compound found specifically in clove oil, eugenol is incredibly effective at protecting the body from external toxins found in the environment, like carbon tetrachloride. It's also a potent natural pesticide, so mixing a little clove oil into your lotion can ward off annoying mosquitos and bugs. You don't really realize how important bay leaves are to Grandma's chicken noodle soup, your favorite bolognese sauce, or classic cooked beans until you accidentally forget to throw one into the mix. When you do overlook these dried leaves, it's clear that something is missing. Although the pungent, almost bittersweet flavor of bay leaves isn't necessarily appetizing on its own, when added into dishes and left to simmer, they impart a little extra depth and dimension. Plus, as it turns out, these leaves also bring some pharmacological properties to the table. Even dried, bay leaves help the digestive system function properly, acting as a diuretic and eliminating toxins. They also contain a plethora of B-vitamins that support the nervous system to increase energy and amp up the metabolic rate. Whether fresh or dried, thyme deserves a permanent place in your pantry, especially during the fall and winter months. The woody and aromatic herb has been used for centuries in aromatherapy to treat illness, but it's proven over time to be a powerful antimicrobial treatment. In fact, thyme actually encourages a healthy immune system by increasing white blood cell formation. Next time you feel a chill coming on, throw some thyme into almost any savory dish to reap the immune-boosting benefits of this spice. Try not to roll your eyes. Black pepper—no duh! Of course you already know about this spice. But before you skim to the next incredible ingredient, reconsider black pepper for its fat-burning powers. Yep, you read that right. That freshly ground black pepper you've been declining at restaurants for years can actually help your body break down fat cells. Plus, pepper raises core body temperature, forcing the body to eliminate toxins via sweat. Too often, nutmeg is relegated to holiday treats (what's up, eggnog? ), but there are plenty of reasons to throw nutmeg into your cooking all year round. Nutmeg has long been used as a home remedy for insomnia—and there's actually something to this old wives tale. This spice has a high magnesium content, which has been proven to help those who suffer through restless nights fall asleep and relax far more easily than normally. The powerful antioxidants myristicin and elemicin found in nutmeg fight inflammation and pain, and some researchers believe actually slow down the deterioration of neural pathways in the brain. Slow down aging and maintain memory for a long time? Sounds like it's time to start adding nutmeg to every morning cup of joe.